When I bought the nut butters from Eddie of Ingr-EAT-ients, we talked about a macadamia nut butter. I love macadamia nuts. They are super tasty and also low in phytic acid, which makes them the best nuts to consume. The only downside is that they are generally more expensive – at least in all the places that I’ve lived. But anyway, since I love macadamia nuts, so does Ryan, and Eddie doesn’t YET offer macadamia nut butter, we decided to make our own. Sorry for the flash making the bottom one look yellow. As the nuts blend, they will start to stick to the side. Scrap them down until the nut mixture begins to form a ball. Add honey, oil and salt. Keep blending until completely smooth and oil, honey and salt are combined. 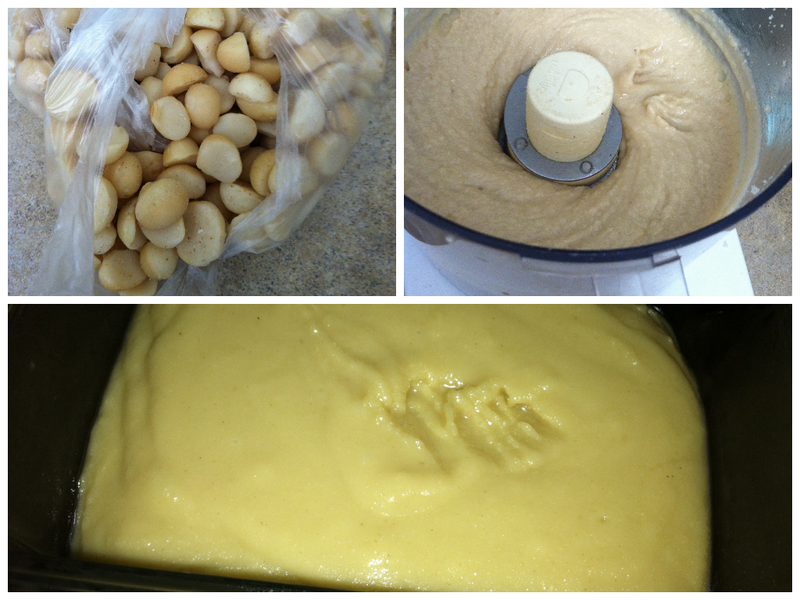 If you want to have a crunchy butter, add in the handful of macadamia nuts now and process for just a few seconds. Serve on anything you want or eat by the spoonful…which we may or may not have done…. For other delicious nut butters, head over to Ingr-EAT-ients and try one of theirs! Especially their new MAPLE BACON ALMOND BUTTER! Bacon…YES! Posted on August 9, 2013, in Recipe Box and tagged homemade nut butter, macadamia nut butter, nut butter recipe, paleo recipe, Primal. Bookmark the permalink. 2 Comments. Wow, that sounds amazing!! Another awesome thing you can do is blend various nuts together–I had great luck making a nut butter out of brazil nuts, almonds, and macadamias (plus Himalayan sea salt and coconut oil). Mmm! Diluting the macadamias also cuts down on cost a bit.